Here's how to understand, and choose from, Google's 12 communication apps and services. Google lags for a variety of reasons. Among these are confusion and uncertainty -- confusion about which app to use, uncertainty about whether Google will terminate any given product. Google offers 12 communications apps and services. Alphabetically, these are: Allo, Chat, Gmail, Google+, Groups, Hangouts, Inbox, Messenger, Duo, Project Fi, Spaces and Voice. If you look at the various communication actions you might want to take -- voice calls, video calls, email, text messaging and social posting -- Google has at least two offerings for each. At the same time, the company has a longstanding habit of ditching old products and services that have seen limited success, including Google Wave, Google Reader, Picasa and many more. According to my informal survey of nearly 3,000 Google+ users, a majority (55% as of this writing) said they hesitate to use some Google products because they're afraid Google might kill them off. Still, the tech giant appears unconcerned about its reputation for killing off products and the uncertainty that reputation engenders. The Google representative told me that delivering the "best experience" involves occasionally dropping products for the sake of focus. The clarifying filter for understanding Google communication products is to consider legacy and the evolution of product direction. Every Google comms app can be categorized as new, old or ancient. That makes the choice easy, right? Just use the new one. Well, not so fast. There are some good reasons you might want to use an older Google product instead of a newer one. For starters, the new version may lack features that you enjoy in the old one. Simplification is the most conspicuous trend in social apps, and it's often achieved by the removal of specific controls. As a result, older versions are often better for power users. Plus, you might want to use an older version because that's where a specific community remains. 3. Integration with other Google services. If you're one of the many users who want to take advantage of these powerful attributes, how do you approach the problem of choosing? If you want to embrace a text messaging app, should it be Allo, Hangouts, Messenger, Voice or Chat? If you're looking for an email service, do you choose Inbox or Gmail? And if you want to interact in a social networking context, should you use Google+, Spaces or Groups? Here's everything you need to know to understand, choose from, and make the best use of Google's many communications apps and services, broken down by function. Google offers three ways to make phone calls via the internet (otherwise known as Voice-over-IP, or VoIP): Voice, Hangouts and Project Fi. All three enable calls to any phone number, and Google offers competitive international rates. Google Voice, which at eight years old is Google's oldest VoIP product, is available on the web and via iOS and Android apps. Voice includes a free phone number for U.S. users. It's like a second phone on your existing phone. Voice includes a free phone number for U.S. users. In settings, you can instruct Voice to ring your home, work or cell phone -- or all three -- whenever someone calls your Voice number. Voice takes voicemails, which are not only available as audio files, but also transcribed and emailed to you. You can also block phone numbers, and when you block them, those callers hear a fake message saying the number is no longer in service. After five years with no major updates to its Voice apps, Google appeared to be slowly pushing Google Voice users toward Hangouts or encouraging them to sign up for the Fi service. For example, Voice users can choose in settings to receive SMS texts and voicemails in Hangouts instead of Voice. 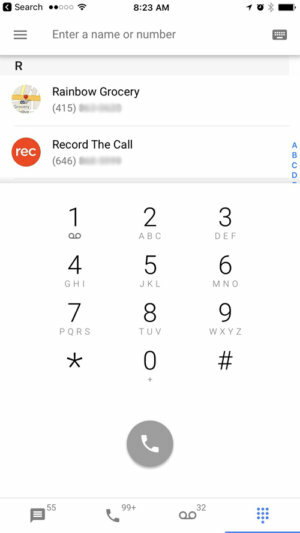 When a Voice user calls via Hangouts, the person called sees the Google Voice phone number in caller ID. And only people who use both Voice and Hangouts can receive calls on Hangouts from a landline or mobile phone originating outside the Hangouts system. Using both Voice and Hangouts improves the functionality of Hangouts. However, in January Google began rolling out an updated version of Voice with a more modern interface and new features, including group and multimedia texting. Seems there's life in the old app yet. Project Fi is best known as Google's mobile virtual network operator (MVNO), which means that Google acts as a mobile carrier but in fact resells the mobile services of actual carriers. Fi is currently available only to U.S. users who own one of four smartphone models (because special antennas are required): Nexus 6, Nexus 5X, Nexus 6P and Pixel. 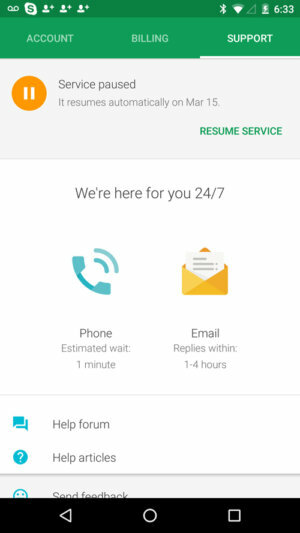 With the Project Fi app, you can pause the service at any time and get fast tech support. Fi's best technical trick is to automatically switch between Wi-Fi calls or any of three U.S. carriers to provide the best connection. Fi also offers low data rates at home and abroad, plus a very straightforward billing plan that can be "paused" for up to three months at a time when you're not using it. Less well-known is the fact that when Voice users sign up to use Fi, their Voice phone number becomes the number for the phone, and their Voice account is essentially terminated and replaced by the Fi account. Google's third voice-calling product is Google Hangouts, the closest thing Google has to an all-in-one communications platform. VoIP calling is merely one of its features; it also supports video calls, instant messages and SMS texts. With Google's launch of Allo for instant messaging and Duo for video calling last summer, however, the company announced that it would refocus Hangouts as an enterprise tool. The company recently closed its Hangouts API for the refocus. Some business apps for Hangouts will remain, but the consumer apps are being terminated. Google is working to integrate Hangouts into the suite of business products formerly known as Google Apps, which the company recently rebranded "G Suite." So, which Google app for internet phone calls? My advice: I recommend that every U.S. user take advantage of Google Voice. It's free and powerful. Whether you ultimately end up using another Google offering as your VoIP service, get Voice now and get the free phone number. I also recommend Project Fi for anyone who owns one of the four supporting Android phones -- or for anyone who travels abroad frequently. If you now use or plan to use G Suite in the future, Hangouts is a great choice. 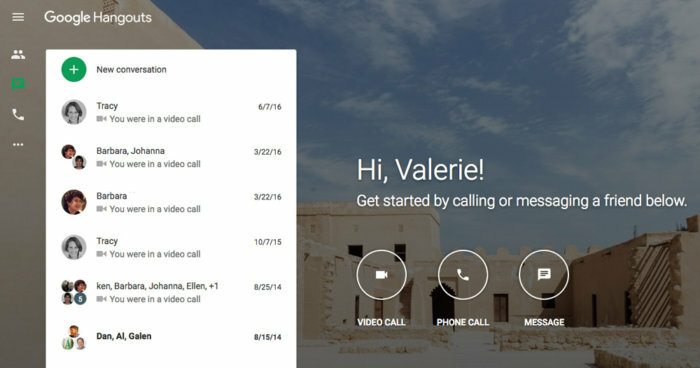 Google gives you two ways to make video calls: Duo and Hangouts. The Hangouts name originated with the group video chat feature of Google+. Some three years ago, Google removed the Hangouts video chat feature, the Google Chat voice calling feature and the Google Messenger messaging feature from Google+, and rolled them all into an app called Hangouts. Hangouts offers video calls, voice calls and text chat from desktop web browsers as well as mobile devices. 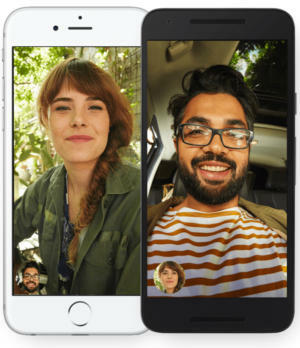 In August 2016, Google launched a new video calling product called Duo, which is available on iOS and Android. For one-to-one video calls, Duo is the best app out there if you want to video chat with, say, your technophobic parents. Just open the mobile app, tap the one button (labeled "Video call") and pick the person you're calling. If they have the app too, you'll be connected on a free, high-quality video call that fills the whole phone screen. For one-to-one video calls, Duo is the simplest app on the market. Because one-to-one video calls on mobile devices is the only thing Duo does, Hangouts is currently better for other kinds of video calls, such as those made via a desktop web browser. Two more differences: Hangouts uses your Google account for identity, whereas Duo uses your phone number. And Duo calls use end-to-end encryption, so it's actually more secure than Hangouts. Duo's biggest downside is that it has fewer users than Skype, FaceTime or even Hangouts. So if you try to connect with a person in your Contacts list, chances are they'll have to install the app before you can connect. However, most consumers who use video chat tend to connect with the same small number of people, so once your family and friends have the app, it works great. Unlike Apple's FaceTime, which works only with Apple devices, Duo works across iOS and Android. If you or a family member or friend has Android, Duo is a nice option. Given Google's refocusing of Hangouts for the enterprise, it's possible that at some point in the future, consumers will no longer be able to use it. Right now, Google isn't saying -- nor is it revealing what additional features Duo will get down the line. My advice: For now, use Duo for one-to-one video calls and keep using Hangouts for all other video calls. Launched as a beta product in 2004, Gmail is (in technology terms) ancient, but has been recently upgraded with a modern interface. The two-year-old Inbox is the newer of Google's two email offerings, and has the advantage of artificial intelligence, making it easy to use. The Smart Reply feature of Inbox gives three reply options you can choose from with a single tap. For example, the Smart Reply feature of Inbox, which is powered by advanced deep neural network machine learning, often gives you three reply options to a specific email message, which you can pick from by clicking on the best option. Google says about 10% of users' replies in Inbox are now made using Smart Reply. Inbox also intelligently bundles similar messages together, so you can dismiss them all with a single click, or process them together. It highlights events, such as trips, clustering together flight and hotel information. And you can even use Inbox to communicate with yourself, using reminders, assists and snooze messages or reminders based on date, time or even location. Generally, Inbox is far more intelligent, automated and easier to use than Gmail. And it's better integrated, too, with hooks into Google Keep and Google Calendar. Users report that the coveted status of "zero inbox" (when you empty your inbox every day) is easier to achieve with Inbox than with Gmail. Gmail, however, still gives users more direct access and control. Unlike Inbox, Gmail has an All Mail folder (where every single message appears), extensive options in Settings, including Filters and Blocked Addresses and experimental "Labs" add-ons. Power users love this stuff. 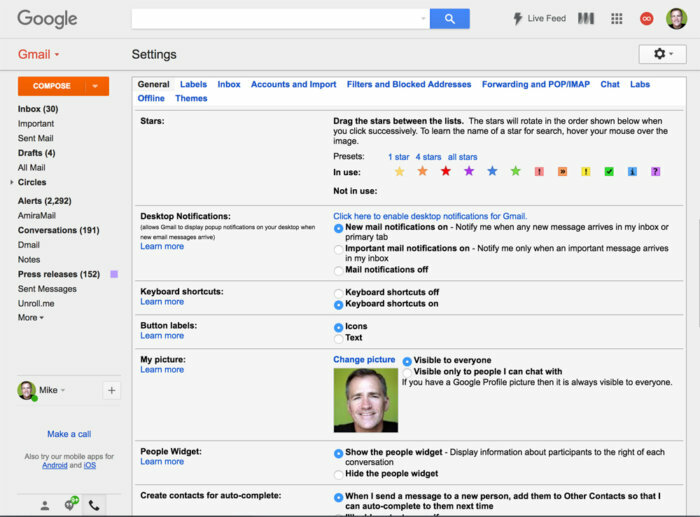 Gmail's busy Settings tabs are complex, but power users love the direct access and control. I asked Google if it plans to combined the ease-of-use features of Inbox with the power user options in Gmail -- or if it plans to phase out the older Gmail. A representative told me that Inbox was created not as a replacement for Gmail, but as an option and that the company plans to continue offering both. My advice: If you want easy, use Inbox. If you want control, use Gmail. Or do what many power users do and use both simultaneously or interchangeably based on daily needs for optimum control of email. Google offers five ways to chat by text: Allo, Hangouts, Messenger, Voice and Chat. You can still use Chat in a web browser by going into Gmail, clicking your name in the left column, and then in the bottom frame of the pop-up menu clicking on "Revert to old Chat." But I don't recommend it. Hangouts offers more flexibility and a better user interface. 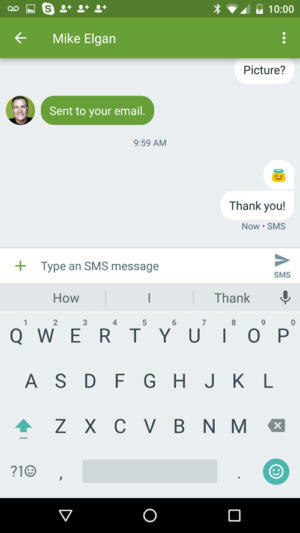 I added Google Voice to this category because Voice offers straightforward SMS and MMS text messaging, including group messaging, which you can use in the mobile app or on the website. Messenger is Google's best way to do text messaging. Sadly, it's for Android users only. Google's best app for SMS and MMS is Google Messenger. Messenger has a great interface, and supports pictures, GIFs, emoji and group texts. You can make it your default texting app, which means that when people text to your phone number, Messenger alerts you. And you can reply to incoming messages from the notifications themselves. However, Messenger is available only on Android. Hangouts supports messaging as well, including texting (but it doesn't support group SMS messaging). Some power users use Messenger for texting with their Android phone's number, and Hangouts for their Google Voice number. And, finally, there's Allo, Google's newest way to chat, which was launched in May 2016. The app is available for Android and iOS. The most unusual feature of Allo is artificial intelligence, which appears in two functions: You can chat with Google's virtual assistant (called, well, Google Assistant) and use the same Smart Reply technology found in Inbox. 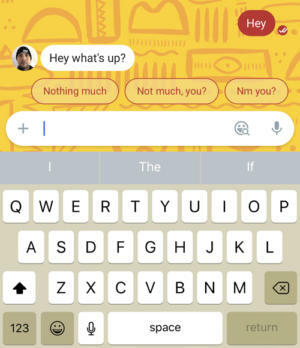 Allo also has all the messaging bells and whistles, including stickers, emoji, visual effects, GIFs and conversation-specific themes. It's likely that there will eventually be lots of third-party add-ons as well. Allo has Google's Smart Reply function, but the app doesn't integrate gracefully with SMS. Controversially, Allo's end-to-end encryption is turned off by default, but you can turn it on by using an incognito mode, which also lets you make messages self-destructing and notifications private. Allo has two significant restrictions. First, it must be associated with a single phone. You can't use Allo on a tablet or laptop, and you can't use the same account on two phones. Second, Allo is awkward with SMS. You cannot set Allo as your phone's default SMS app. And when you try to send a message to a non-Allo user (which on other platforms simply fails over to straightforward SMS), the recipient gets a text message not from you, but from a weird proxy number and a message asking if they want to opt out. If they don't, you can exchange text messages. But they will always get the message from the proxy number, not yours. Allo is great for talking to the Google Assistant, and the best messaging app for talking to someone else who also uses Allo. But it's weak for the vast majority of people who don't use Allo strictly. My advice: If you're on Android, use Messenger. If you use G Suite, go ahead and use Hangouts for messaging. If you use Google Voice, then of course use Voice or Hangouts for text messages sent to the Voice number. And if you're on iOS and looking for an all-purpose messaging product, I would not recommend Google. Instead, choose Apple's Messages app or Facebook's WhatsApp or Messenger. All these alternatives give you all the bells and whistles, plus the ability to include SMS contacts gracefully. Google offers three completely different ways to post in social contexts: Spaces, Google+ and Groups -- the respective new, old and ancient ways of posting socially. The most unusual aspect of Google's social services is that they're all free and none of them has advertising. Google Groups is 16 years old! It's an all-purpose message board service for joining and engaging in threaded conversations on the web or via email. It also plugs into Usenet, which even predates the web. 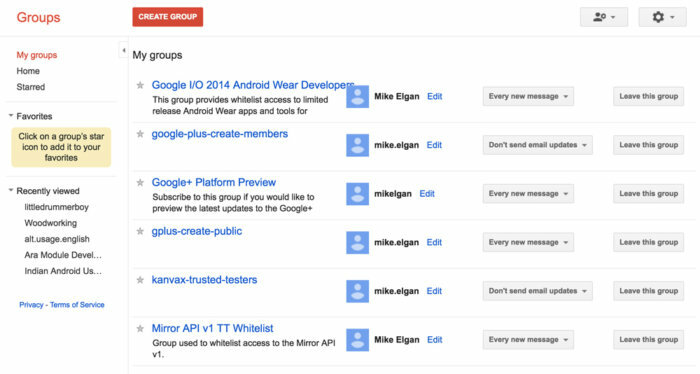 Google Groups is what social networks were like before they were called social networks. The only reason to use Groups is if you have a holdout community that still uses the service. Some people still use Groups because at some point they joined a Group (because of some event or organization), and that's where the conversation remains. Google+ started in 2011 as the Mother of All Communications Networks. In Google+'s first couple of years, you could use the service to send email, text, make video calls, lifelog, edit and share photos and more. A few years ago, Google reversed its all-in-one approach and decided to pull out different communication features into separate apps. So the company stripped Plus for parts, spinning out Hangouts, Photos and other products. Today, Google+ is like a cross between Facebook and Reddit, which is to say, a social network like Facebook but centered around moderated interests and topics like Reddit. Google+ content is organized by "Collections," which enable people to follow your content à la carte -- to get the posts they're interested in without getting the stuff they don't care about. Google+ content is organized by "Collections" (user-created categories of content that only the creator can post to, but which followers can follow individually -- so you can follow my "tech" posts without being subjected to my "food" posts) and "Communities," which are moderated user-created categories that others can join and all members can post to. Google's spokesperson told me that people are joining Communities at the rate of 1.6 million joins per day, and that Collections are growing even faster. Google Spaces, which is less than a year old, is the social service for people who hate social networks. It's not like Facebook, where you "follow" people and then get a filtered stream of what those people post. 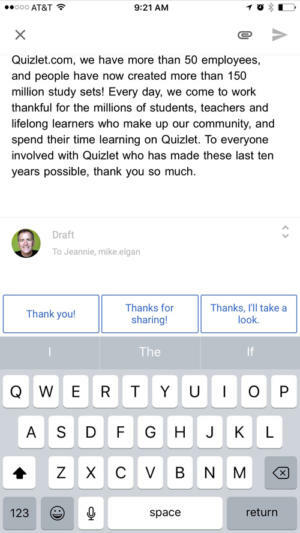 With Spaces, you invite people into individual conversations. Every conversation is an ad hoc island of interaction. Google Spaces is like a social network, but you can't follow people. You can follow only individual conversations. In other words, unlike most social sites (including Google+), the network effect -- which says that the more people who use a product or service, the more valuable it is to everyone -- does not apply. Its usefulness is the same whether 100 people use it or a billion people do. 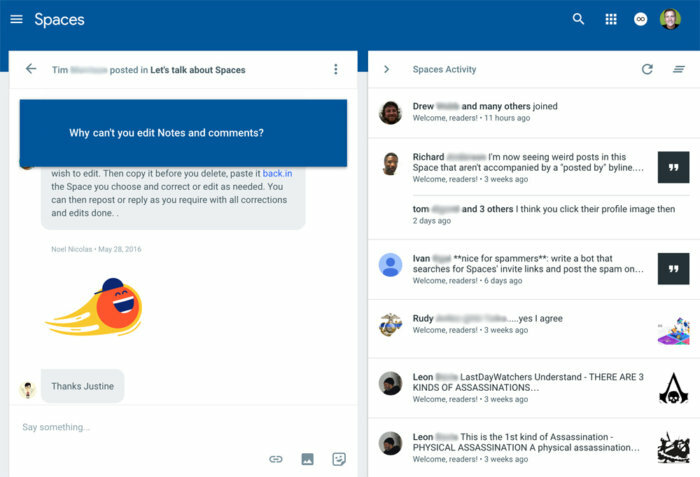 Spaces is ideal for spinning out conversations from Twitter, Facebook, email or group messaging applications, where people can voluntarily engage without being restricted by Twitter's 140 characters or without subjecting victims to email Reply All madness. It's also a good place to share links with one person or a small group of people, even if you don't engage in a full-blown conversation. My advice: Avoid the antiquated Google Groups if you can. 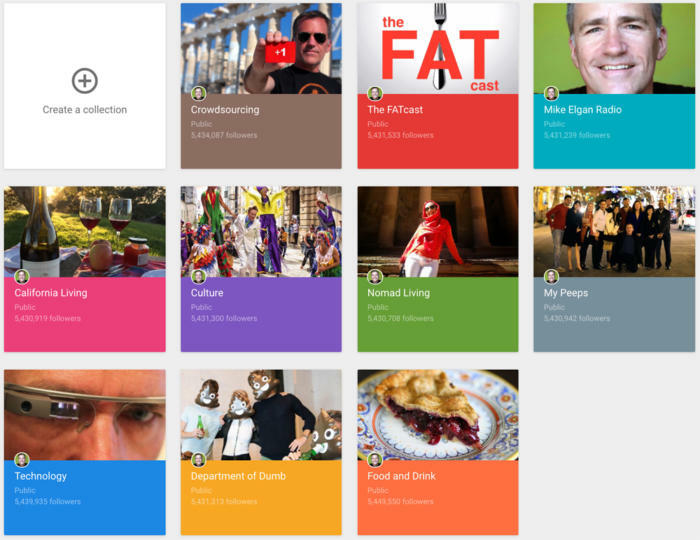 Use Google+ if you like to talk about your interests, passions, hobbies or business. And don't forget about Spaces. It's an all-purpose location to spin out conversations that start on other media. I can't convince Google to consolidate and simplify its communication options. But I can offer my best advice for which products to choose and why. If you want easy and simple, use Messenger, Duo, Fi (if you have the right phone), Inbox and Spaces. And use your phone for voice calls. If you want power and control, use Gmail, Google+, Hangouts and Voice. I don't recommend Allo, Chat or Groups. Yes, Google's lineup of 12 communications apps and services is confusing. And, yes, Google has a reputation for terminating products. But for many, Google's amazing AI, search and integration are just too good to pass up.